"This recipe is delicious! You may substitute the strawberries for any other berries or fruit." Blend the banana, yogurt, sugar, pineapple juice, strawberries, orange juice, and milk in a blender until smooth. Delicious! I used fat free vanilla yogurt and skim milk to keep it on the lighter side. This was very good for breakfast. The only change that I made on this was I added oatmeal to it. I wanted it to have extra fiber, but other than that, this is a good beverage. thanks for sharing it. I used a large frozen banana, Stacy's organic vanilla yogurt and 1/4 cup Dole strawberry-pineapple-orange juice. The kids thought this was great, though I did have to add a little more juice. I love this! its sooooooooo good! i had to use a little bit more milk and juice. 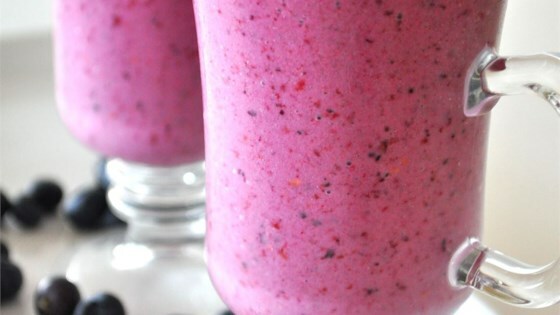 For you for this delicious smoothie! Very good. I added a handful of fresh blueberries and some fresh pineapple but thats it.